Analyze efficiency measures during the design process and account for the results in design decision making. Use energy simulation of efficiency opportunities, past energy simulation analyses for similar buildings, or published data (e.g., Advanced Energy Design Guides) from analyses for similar buildings. Analyze efficiency measures, focusing on load reduction and HVAC-related strategies (passive measures are acceptable) appropriate for the facility. Project potential energy savings and holistic project cost implications related to all affected systems. Demonstrate a Performance Cost Index (PCI)1 below the Performance Cost Index Target (PCIt) calculated in accordance with Section 4.2.1.1 of ANSI/ASHRAE/IESNA Standard 90.1-2016, Appendix G, Table 4.2.1.1. For mixed use buildings, the required PCI shall be calculated by using an area weighted average of the building types. Calculate the PCI, PCIt, and percentage improvement using metrics of cost and greenhouse gas (GHG) emissions. For each energy source serving the building, the GHG emission factors must be identical for the Baseline and Proposed building models. 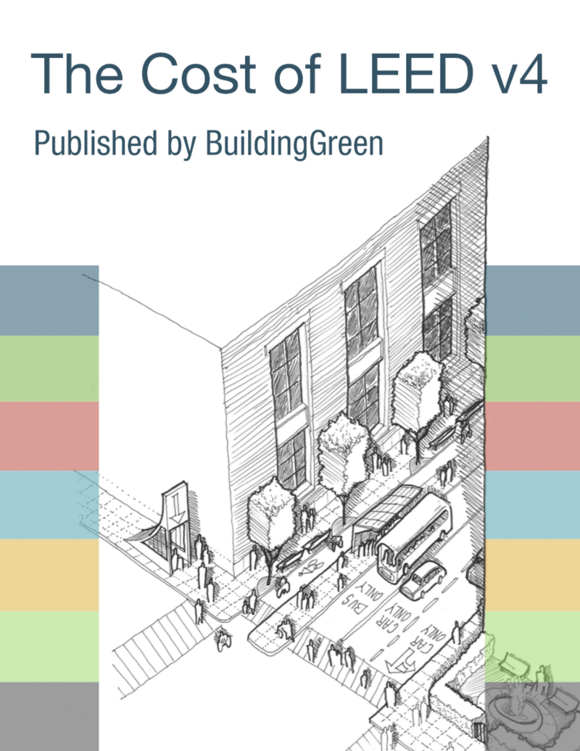 LEED points are calculated based on the project percent improvement PCI below the PCIt using metrics of cost and GHG emissions. Total points have been divided equally between the metrics of energy cost and greenhouse gas emissions. Points are awarded according to Table 1 and Table 2. For project percent improvement for the cost metric, on-site renewable energy may be subtracted from proposed energy cost prior to calculating proposed building performance per ASHRAE Standard 90.1-2016 Section G 2.4.1. On-site renewable energy may be subtracted from proposed greenhouse gas emissions prior to calculating proposed building performance per ASHRAE Standard 90.1-2016 Section G 2.4.1. New off-site renewable energy as defined in EA credit Renewable Energy may be subtracted from proposed greenhouse gas emissions prior to calculating proposed building performance. Appliances and equipment. For appliances and equipment not covered in Tables 1–4, indicate hourly energy use for proposed and budget equipment, along with estimated daily use hours. Use the total estimated appliance/equipment energy use in the energy simulation model as a plug load. Reduced use time (schedule change) is not a category of energy improvement in this credit. ENERGY STAR ratings and evaluations are a valid basis for performing this calculation. Display lighting. For display lighting, use the space-by-space method of determining allowed lighting power under ANSI/ASHRAE/IESNA Standard 90.1–2016, with errata (or a USGBC-approved equivalent standard for projects outside the U.S.), to determine the appropriate baseline for both the general building space and the display lighting. Refrigeration. For hard-wired refrigeration loads, model the effect of energy performance improvements with a simulation program designed to account for refrigeration equipment. To be eligible for Option 2, projects must meet the Scope requirements of the applicable AEDGs (or combination of AEDGs for mixed use), and projects must use the ASHRAE 90.1-2016 Prescriptive compliance path in EA Prerequisite Minimum Energy Performance. Implement and document compliance with the applicable recommendations and standards in Chapter 4, Design Strategies and Recommendations by Climate Zone, for the appropriate ASHRAE 50% Advanced Energy Design Guide and climate zone. Interior and exterior lighting, including daylighting and interior finishes (1 point). CS: Minimum 20% of building area must have a complete lighting design. HVAC Systems and Controls (2 points, 1 point CS). CS scope of work must include at least 20% of the building’s projected cooling capacity, heating capacity, and fan volume. To be eligible for Option 3, projects must use the ASHRAE 90.1-2016 Prescriptive compliance path in EA Prerequisite Minimum Energy Performance, and must not have more than 2,000 square feet of data center space, laboratory space, or manufacturing space. Demonstrate an improvement beyond ASHRAE/ASHRAE/IESNA Standard 90.1–2016, with errata, for the following systems: Interior and Exterior Lighting; Daylight controls; Building envelope; HVAC and service water heating equipment efficiency; and Equipment and appliances. Each three strategies selected earns 1 point (For Core & Shell lighting and HVAC efficiency measures, the project scope of work must include a complete design for at least 20% of the building area to qualify). Daylight controls: Install daylight-responsive controls for a given percentage of connected lighting load (lighting in non-regularly occupied space with occupant sensor controls may be excluded from connected lighting load). Electric resistance heating except heat pump auxiliary heat must be included in total capacity. ENERGY STAR equipment including appliances, office equipment, electronics, and commercial food service equipment (lighting and building envelope products are excluded from this credit). (Electronic Product Environmental Assessment Tool (EPEAT) equipment may be used in lieu of Energy Star equipment where applicable). Prescriptive commercial kitchen and refrigeration equipment requirements listed in Appendix 3, Table 1. The project scope of work must include at least 0.25 Watts per square foot of eligible equipment to apply this strategy.